Three Rivers Press, 9780307985934, 320pp. How could something we have for free—our bare feet—be better for running than $150 shoes? The truth is that running in shoes is high-impact, unstable, and inflexible. Shoes promote a heel-centric ground strike, which weakens your feet, knees, and hips, and leads to common running injuries. 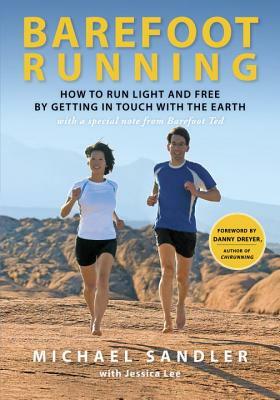 In contrast, barefoot running is low-impact, forefoot-centric, stable, and beneficial to your body. It encourages proper form and strengthens your feet in miraculous ways. When you run in shoes, you not only risk developing poor form, but you also hinder the natural relationship with the ground that running facilitates. Barefoot running restores the delightful sensory and spiritual connections to the earth that you were meant to experience. Barefoot Running offers the only step-by-step direction runners need at any age to overcome injuries, run faster than ever, and rediscover the pure joy of running. Once you tear off your shoes and learn to dance with nature, you’ll tread lightly and freely, hearing only the earth’s symphony and feeling only the dirt beneath your feet. Hit the ground running with revolutionary techniques for starting out slowly, choosing minimalist footwear, navigating rough weather and rugged terrain, and building your feet into living shoes. MICHAEL SANDLER is a barefoot running and walking expert who has coached athletes professionally for nearly twenty years. After a near-death accident left him with a titanium femur and hip, Sandler was told he could never run again. It was only by going barefoot and feeling the ground that he began to heal. He now runs ten to twenty miles a day, pain free. JESSICA LEE experienced nagging knee pain and hated running until the day she went barefoot. Now she helps women of all abilities experience the joy of running light and free.